MADISON, Wisc. (April 3, 2018) – Despite multiple warnings and statistics sent out by traffic safety organizations every year, studies continue to show that distracted driving remains prevalent among drivers of all ages. 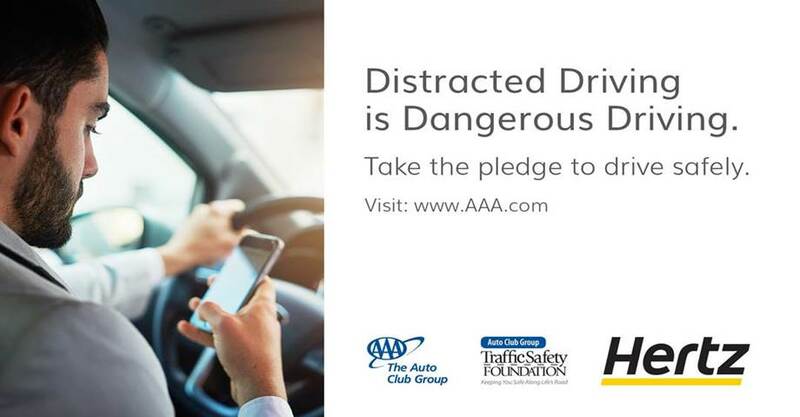 As part of Distracted Driving Awareness Month in April, AAA – The Auto Club Group and Auto Club Group Traffic Safety Foundation are partnering with The Hertz Corporation on a campaign that encourages motorists to evaluate their driving habits and take a pledge to stay focused on the road, avoid cell phone use and minimize other distractions. Established by AAA – The Auto Club Group in 2010, Auto Club Group Traffic Safety Foundation, Inc. (ACGTSF) is a 501(c)3 non-profit organization and public charity dedicated to producing a significant and continuous reduction in traffic crashes, injuries and deaths in the communities targeted by its efforts. ACGTSF provides programs, education and outreach to increase public awareness about the importance of traffic safety and improve driving behavior. ACGTSF is funded by voluntary, tax-deductible contributions from organizations and individuals who support ACGTSF’s purpose. Visit www.AAA.com/foundation for more information.